White supremacists buy Trump robocalls in Iowa. 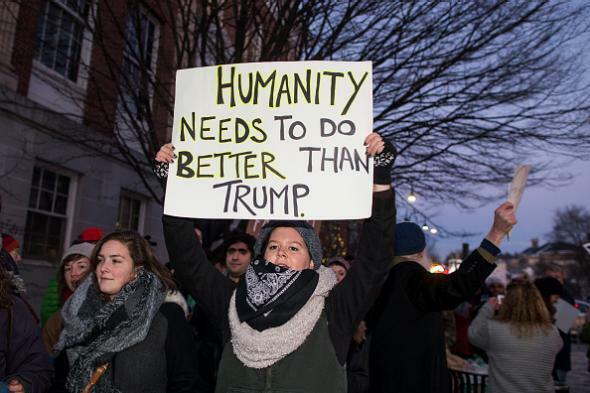 A protester outside a Donald Trump rally in Burlington, Vermont, on Jan. 7, 2016. I’m Jared Taylor with American Renaissance. I urge you to vote for Donald Trump because he is the one candidate who points out that we should accept immigrants who are good for America. We don’t need Muslims. We need smart, well-educated white people who will assimilate to our culture. Vote Trump. The Quad-City Times confirms that Iowa residents are receiving the calls, which American Freedom claims it has placed 300,000 of.